Graphic by www.donatelifeny.org. Here is some information on organ donations in the event your loved one had a desire to do so. In our current day, medical science has made incredible progress in the area of organ donations and the ability to transplant and use organs, bones and even skin of the deceased donors. Reports of some blind people who have been donated corneas are now able to see because of the donations provided by deceased persons. People who were constantly hooked up to dialysis machines can now can lead more active lives with a donated kidney and have a chance at a longer life span. There are even more who are thankful for other organs such as livers, hearts, lungs and pancreases. 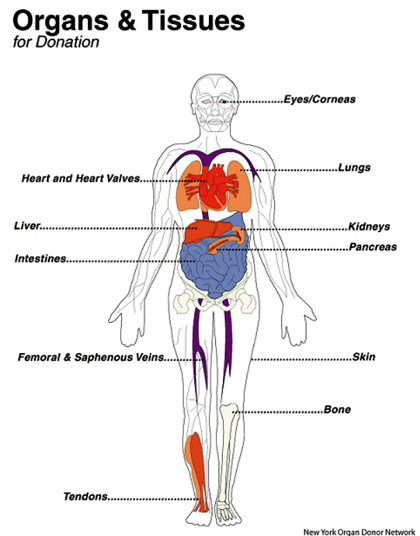 There are two types of donations for organs that are also referred to as Anatomical Gifts. The first is body donation which is specifically for research in medicine. The second type are donations specifically for transplant purposes and given to those who are sick and in need to a specific organ. When you become an organ donor, there is a sticker that is affixed to the back of the driver's license or identification card to inform families of the donor choice the individual has made. Even with this sticker that denotes of donor approval, the surviving family members still needs to request this or the donation may not happen. If the deceased has not indicated donation status, a physician can get permission from the surviving family members. Of course, the organs must be free of disease and healthy in order for it to be donated for transplant purposes. After death, the body is sent to a medical center or organ bank to remove the organs. Transportation of the body to the facility is not always covered by the institution. So you may have to cover the costs, if this is the case. If the deceased does a full body donation, it must be free of any missing limbs or damaged caused by accident or disease, in order for it to be deemed acceptable. After the organ is removed, the family can still have a viewing or open casket, if desired.